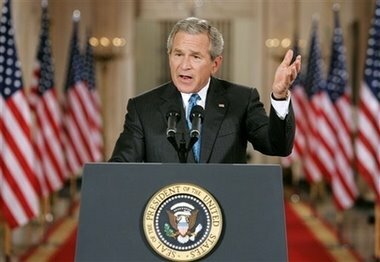 Bush gave a broadcast speech in support of secret prisons and torture. He surrounded himself with lots of American flags in case you were wondering if this is still America. The centerpiece of the speech was a story about how the torture of Abu Zubaydah (who many analysts doubt is as important as the US claims he is, or indeed as important as he claims he is). 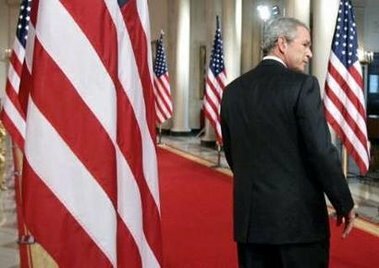 It’s a rather odd and not hugely believable story, or maybe it’s just the way Bush tells it. Zubaydah, who the US had shot and was holding in a secret prison, “declared his hatred of America. During questioning, he at first disclosed what he thought was nominal information,” including descriptions of Al Qaida members planning a terrorist attack in the US, and where to find them. Then he clammed up, and “it became clear that he had received training on how to resist interrogation. And so the CIA used an alternative set of procedures. ... I cannot describe the specific methods used -- I think you understand why... But I can say the procedures were tough, and they were safe, and lawful, and necessary.” So they extracted information from him through these unnameable “procedures,” and then “confronted” other prisoners with it, whereupon they immediately caved: “When confronted with the news that his terror cell had been broken up, Hambali admitted that the operatives were being groomed at KSM [Khalid Sheikh Mohammed]’s request for attacks inside the United States -- probably [sic] using airplanes.” Evidently despite being trained to resist interrogation, they never considered the possibility that interrogators might lie to them. The [sic], by the way, is in the transcript, rather mysteriously. There’s another mysterious sic, a reference to Al Qaida and Taliban fighters being “held secretly [sic]”. According to him, any number of plots to blow things up, fly airplanes into things, or spread anthrax, have been thwarted because of data given by prisoners held secretly [sic] after alternative sets of procedures were used upon their persons. And yet he claimed once again, “the United States does not torture.” As proof of this, he cites the McCain Act, neglecting to mention his signing statement. So he won’t tell us – “I think you understand why” – the procedures that induced fanatical terrorists to betray their ideals, their plans, their friends and their cause, but the United States does not torture. Phew. He does tell us that CIA interrogators “had to complete more than 250 additional hours of specialized training”. Oddly enough, he says that like it’s supposed to be reassuring. Today marks the first time that the White House has admitted that the CIA holds prisoners in secret prisons outside the country. It has not said under what legal authority it does so, or where those prisons are. Or did so, since Bush says that the CIA’s prisoners are all being transferred to DOD control at Guantanamo. Since they’ve denied up until now that there were secret prisons and secret prisoners, I can’t imagine why we would take that claim seriously. Also, the Pentagon today released a new interrogation manual, which bans hooding, the use of dogs, sexual humiliation, waterboarding, etc. None of this applies to the secret CIA prisons. 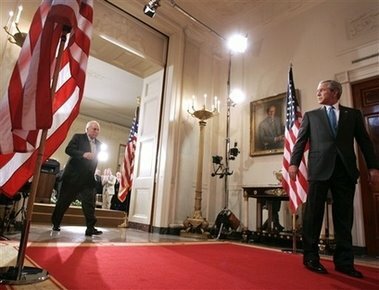 Bush demanded that Congress pass laws establishing military tribunals and ensuring that interrogators using alternative procedures cannot face prosecution under the War Crimes Act.